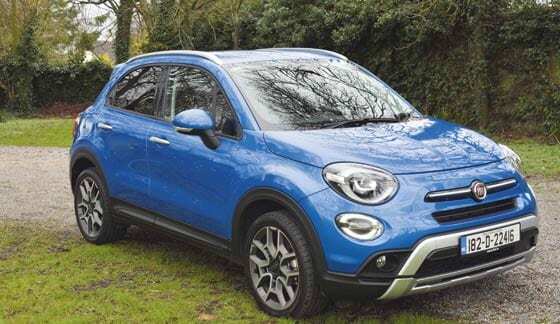 THE FIAT 500X is a crossover, not only in terms of vehicle segment, but also in terms of its potential customers. FIAT has face-lifted the 500X for 2019 in the hope that customers will appreciate the outright value on offer, and “cross over” from rivals such as the Kia Stonic, Renault Captur, SEAT Arona, and Dacia Duster. Revisions to the 500X include new LED headlights, LED daytime-running-lights, LED rear light clusters, redesigned front & rear bumpers and a refreshed interior, along with advancements in driver assist technology. Thankfully, however, the new car still retains the bold, stylish and unique character of its predecessor, and still possesses a strong road presence. 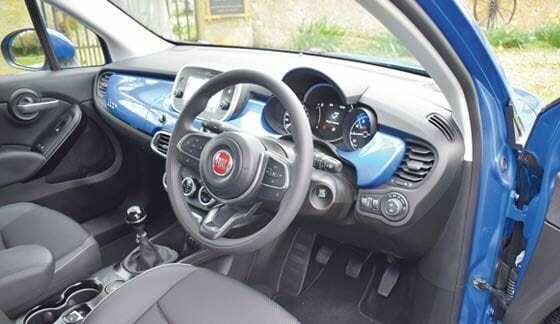 Inside the new 500X, the dash itself has been slightly reshaped, and there are tweaked dials. All 500Xs come with a 7” central touchscreen and – between the dials – a 3.5” colour TFT screen. The front seats offer a high degree of comfort and adjustability, with wraparound bolstering and perfectly aligned arm rests in the centre console and door trims to aid relaxed cruising. With an “H point” of 669mm (distance from the ground to the driver’s hip), the FIAT 500X offers excellent visibility, while also ensuring that passengers feel safely enclosed and connected with the vehicle. Available in two trim levels – Urban Look, and Cross Look – the new 500X has a boot capacity of 350-litres with the rear seats in place, but this figure increases dramatically once the rear seats are folded – thereby, making the car very practical indeed. The Urban Look model is available with just one petrol engine, a 1.6-litre ‘eTORQ’ power-plant with 110bhp, and mated to a five-speed manual gearbox. 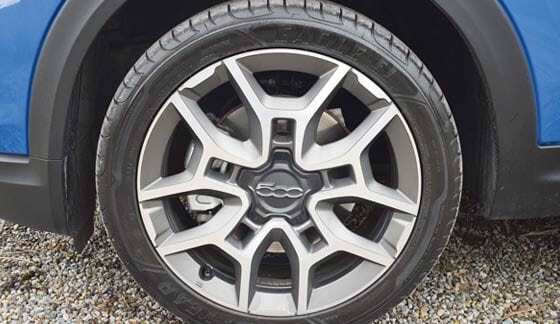 However, two petrol engines are available in the Cross Look model – a 1.0-litre ‘Firefly’ producing 120bhp, linked to a six-speed manual gearbox, or a 1.3-litre ‘Firefly’ producing 150bhp, and only available with a DCT (automatic) gearbox. The car I drove was a FIAT 500X Cross Look, fitted with a 1.0-litre turbo-petrol engine, and finished in stunning Blue Italia metallic paint. Stylish on the outside, and comfortable on the inside, my test car came with a long list of standard equipment, such as automatic climate control, cruise control, electric windows, height-adjustable driver’s seat with armrest and longitudinal roof bars. It also featured rear parking sensors, reversing camera, remote central locking, split-folding rear seats with head restraints, 7” HD touchscreen radio with 3D navigation, Bluetooth with USB and DAB and six speakers. It also included Apple CarPlay & Android Auto connectivity, Uconnect Infotainment Live, 17” alloy wheels, Lane Keep Assist, Road Sign Recognition, and Intelligent Speed Assist. The refreshed interior in the new 500X provides refined elegance, and exclusive comfort for every road trip. The new 1.0-litre turbo-petrol engine in my test car produces 120bhp and 190Nm of torque, while being capable of returning fuel economy of up to 56mpg (extra-urban). This sweet-revving engine is capable of completing the 0-100km/h sprint in 10.9-seconds, while a top speed of 187km/h is impressive. The standard six-speed manual gearbox in my test car was very slick, and enhanced the overall driving pleasure, while the steering was well weighted and precise. The fact that the new FIAT 500X shares its underpinnings with the JEEP Renegade (a close relative) will serve to enhance the desirability of FIAT’s terrific SUV. The revised FIAT 500X is priced from just €21,795 (excluding delivery), with my test car specification priced from €24,995. Overall, the FIAT 500X is a well-rounded, high-quality, rugged, and handsome SUV, which deserves to be on every compact SUV buyer’s wish list.